"Use spinach, Parmesan cheese and California Almonds to give pesto a new flavor. Toss this with pasta and tomatoes." Place almonds and pine nuts (keep separate) in a single layer in a dry skillet over medium heat. Toast, stirring occasionally until fragrant, 3-5 minutes. Combine all ingredients except 1/2 cup of the slivered almonds in a food processor, blending just until smooth. 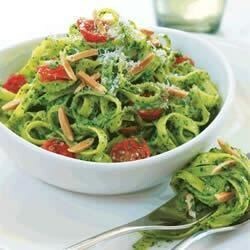 Toss pesto sauce with cooked fettuccine and top with roasted cherry tomatoes and remainder of slivered almonds. The recipe made a LOT of the pesto, too much. And it was like eating pureed spinach. Did not taste the almonds or (expensive) pine nuts. I used walnuts as I was out of pine nuts. Delicious with fresh spinach. I used Cashews instead of pine nuts. Good - but too much on the cheesy side... and can i make it with raw -fresh spinach - uncooked - that's what i will try next!